Kenwood Radios is a huge electronics corporation that creates not only communications equipment but entertainment gear as well. Naturally we will be delving into only the communications equipment for this web site. Specifically we will take a look at radio gear that can be used in SHTF, prepper, or survivalist situations. Of course the previous three scenarios could also include portable amateur radio operations but that isn’t what RadioSurvivalist.com is all about. Of course for the sake of discussion we will only be discussing Kenwood equipment made for the amateur radio market. To start off with let’s take a short peek at the HF offerings that Kenwood has. 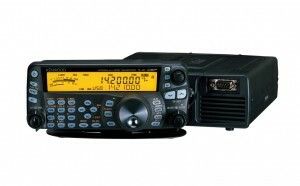 Kenwood is well known in the amateur radio community as a leader when it comes to DXing and contesting. But neither of those have anything to do with the needs of a survivalist, a prepper, or any similar situation. In fact Kenwood’s three main HF radios can only be used as base stations solely because of the size. Actually Kenwood’s so called “flagship” radio is too large for many average size operating desks. The only amateur radio, for the HF bands, that Kenwood offers that can be used in either mobile or other portable operations is the TS-480HX . Size alone is what makes this radio attractive to preppers and/or survivalists. When it comes to mobile radio gear Kenwood offers only three choices of radios all of which fall in the VHF and UHF bands. Not that this is a bad thing but they focus most of their attention on their HF radios. As of the date of this posting they offer two 144/440 MHz radios and one 144 MHz radio for mobile operation. Of course any mobile radio can also be used as a base station with a power supply and a base station antenna. Kenwood has similar offerings in the handheld radio department. As with their mobile selection they offer only three handheld radios. Two of them are 144/440 MHz radios and one 144 MHz radio. To say that Kenwood would not be a good choice for SHTF scenarios might be true judging by their meager offerings in the mobile and handheld radios department. Combine that with only one HF radio and you will see they are less than attractive for the prepper/survivalist market.